Rogue Fitness makes a barbell to fit into pretty much every category of value. Almost every bar I review fits right into the mid-range category and never before have I even touched a barbell worth more than $600. That is until Rogue ran a bunch of closeouts on their barbells and I managed to snag a EU and a NA bar for prices that I just could not pass up. Before these deals came up, I was seriously toying around with the idea of purchasing an Eleiko. Which still might happen in the future, but as of right now I’m totally content with my Rogue EU bar. This is the finest piece of steel I’ve used and I don’t know exactly how much better barbells could be, even if they do cost hundreds more. I’ve heard things like “Rogue doesn’t make a bar to compare to Eleiko’s or Werksan’s”; and maybe they don’t for some people. I don’t think that applies to the 80% of lifters that won’t ever touch one of those brands. The WL barbell’s quality is of typical Rogue fashion: top notch. There are no rattles, the knurling is 100% uniform with perfect endings and the polished chrome finish is beautiful. Well at least on my EU bar, which was basically brand new without end caps. My NA bar came used, who knows how long for, but the original NA bar I had from the 2014 Games was gorgeous. Knurling is always a touchy subject and I think what mainly put me off from an Eleiko bar is the fact that I’ve heard the knurling is pretty harsh. That may be fine for a dedicated Oly lifter, and not that I’m going to use either of these bars for metcons (maybe the NA bar), but I need my hands to be in good condition to do other things. At first glance, the knurling on the Rogue WL bar’s looks very light, even when in the hand it feels light, but when you start lifting that all changes. I never found myself absolutely needing chalk to get a good grip on the bar; most of the time I don’t use chalk because I’m lazy to clean it up as well. People say that Eleiko’s knurling grips you back, and I’m not going to use that analogy on the Rogue WL bars, but there is never a lack of grip. Though I still managed to tear a piece of dead skin off my hands, I didn’t get any hotspots from using either of the WL bars. Also to note, the center knurling is so passive that you’d hardly even notice it normally, but you will reap the benefits of having it there as it does add a little stick to your skin or shirt. Both EU and NA bars use the same amount of needle bearings per sleeve. Five per sleeve leading to ten total throughout the bar. I found that my current NA bar rotates a lot better than my original one did, but it’s not as smooth nor as quiet. It seems one of the sleeves on my NA bar is louder than the other. The EU bar is a different story with the spin being very quiet and completely uniform with both sleeves. Both NA and EU bars spin as freely as the other, but the nod definitely goes to the EU bar for being more quiet and smoother. Most wouldn’t even bat an eyelash at this, but since I have both barbells, there’s something to compare it to. The EU bar has a European sourced 216k ksi tensile strength shaft and the NA has an American made 190k ksi shaft. The oscillation of both bars feel the same at the weight I’m lifting, but this could change in the hands of a more skilled lifter. The NA bar is the bar they use at the Games and the athletes don’t seem to be complaining about it. Ian Wilson also uses the EU bar for training, and I heard he’s pretty good too. For 99% of the lifters out there, the whip will be more than adequate on either of these barbells as they fall in line with just about every other barbell I’ve reviewed. Comparatively speaking, light years better than the Klokov bar but slightly not as much as the Vaughn or California bars. If you’ve looked into buying either of these barbells, then you’ve probably looked into buying an Eleiko bar as well. The EU bar retails for $695 and the NA bar for $635; compared to the Eleiko Sport Training bar at $729. The Rogue bars aren’t IWF certified so you can’t use them on a platform, hence the comparison to the ST bar; which also happens to have only eight bearings compared to ten. Not a huge difference in price between both European bars, but a pretty substantial difference in the NA to ST bar. First, ask yourself: Who am I? (i.e. weightlifter, CrossFitter, trust fund baby) Then follow that up with: Can I afford this? That will eventually lead up to: Do I really need this? Truth is, using either of these barbells will not give you magical powers. I haven’t hit any PR’s on them yet and even if I did, I wouldn’t credit the bar for that. For most people, the Rogue Training Bar would suffice, even the Rogue Bar 2.0 or Ohio Bar. If your craft is weightlifting or you’re an elite level CrossFit athlete where it’s your job to train, then by all means; you’d probably get your money’s worth. If you’ve got the money to spend and you don’t mind dropping it on a barbell, then there is no finer (IMO) choice than the Rogue Euro bar, with the NA bar at a very close second. My plans on getting that Eleiko are on indefinite hold. 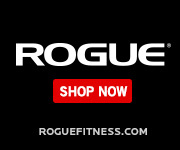 Get your Rogue Equipment here! Your purchase through my links help me afford new things to review!